Stephen Hawking, 75, a multiple award-winning pioneer in the field of theoretical physics, continues to inspire after decades of scientific work. Hawking is also known for his struggle with ALS, a disease that has left him paralyzed and unable to speak. Without the aid of assistive technology, he would not have been able to communicate his brilliant mind and the world of physics might not have progressed as it has. Hawking told an interviewer once that he would like to be regarded as “a scientist first, popular science writer second, and, in all the ways that matter, a normal human being with the same desires, drives, dreams, and ambitions as the next person.” This statement is integral in understanding why accessible design is so important. What is Accessible Design in the First Place? Accessible designs are those that comply with the unique needs of people that have sight, auditory, physical, or cognitive impairments. To name a couple of examples that are relevant in the tech world, it takes into account users who need tools such as screen readers or hardware assistive technology to navigate through websites. Why is Accessible Design Important? Those with impairments need to accomplish the same tasks as those without. It’s our responsibility as a team to ensure that all users can achieve their goals with our products, regardless of their ability. Technology allows everyone to access the world in ways that we couldn’t previously, in particular for those with disabilities. For example, Stephen Hawking would not be able to express himself without his specialized computer, which he types on using movements with his cheek! Technology has been helping those in need for decades, and now that technology and the internet are no longer luxuries but necessities, we must be accommodating in our digital work to those with disabilities. While Hawking is a particularly well known example of someone with impairments, there are people in our everyday lives that may require and benefit from accessible designs. According to the Centers for Disease Control and Prevention, approximately 1 in 5 adults in the United States has a disability. The Americans with Disabilities Act has made it a requirement for architects and interior designers to accommodate those with disabilities. Yet, there are zero regulations for digital products within the United States even though so many people are impacted by our reliance on the Web and their ability to utilize these resources properly. It’s our responsibility as creators to make accessibility a requirement within our work and a standard that we uphold throughout our designs. Although it’s not yet mandatory, all members of your product team should have knowledge in accessibility standards and should ensure that when delivering a product, those standards are met. Whether you are a designer, content creator, or developer, meeting the needs of those who are disabled should be at the forefront of our minds, not an afterthought. Instead of creating something, then backpedaling and updating it for accessibility, your team will save time and money if accessibility is a consideration from the beginning. Additionally, your clients will appreciate this effort too since it’s likely that they don’t want to alienate any users from their products. Accessible designs not only benefit those with impairments, they benefit everyone. When designing, always keep in mind the POUR principles: Perceivable, Operable, Understandable, and Robust. The World Wide Web Consortium (W3C) possesses the jurisdiction on accessibility and maintains a comprehensive checklist called the Web Content Accessibility Guidelines (WCAG). This checklist aims to meet various levels of accessibility that are categorized by those four principles and also by discipline. 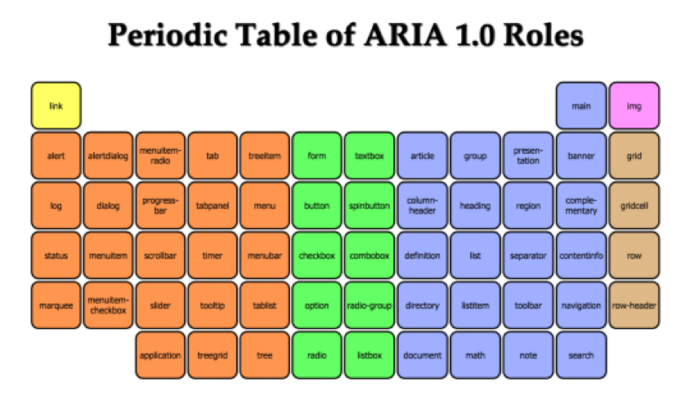 Developers should implement correct ARIA roles so that screen readers can adequately describe what is displayed in the interface and voice recognition software can easily ascertain what a person is communicating back to the application and sufficiently understand their intent. Visual designers must use appropriate levels of color contrast in their designs so that content can easily be seen by those with visual impairments. Content writers should format written content, such as links, in a way that is meaningful and can help people understand context, location, and direction. UX Designers should ensure that when designing forms, text placeholders are not used as those with cognitive impairments will have trouble remembering the content within a field once they begin typing. These are just a few examples of a plethora that display how various team members can implement accessibility requirements in their products. Remember: your products can either help or hinder someone trying to achieve their goals, like the next great theoretical physicist or a friend of yours just trying to accomplish an everyday task. Ensuring that your products are universally designed will help create a more accessible world for everyone.